The Woodberry and Harris Organ Company of Boston, Massachusetts, existed between 1888 and 1893. Its principal namesake, Jesse Woodberry, learned the trade with W. G. Vowles Organ Works in Briston, England. He moved to the United States in the early 1880s and worked for the Hook and Hastings company in Boston. Woodberry, his brother James, and James Cole started their own business in 1886. Two years later, Woodberry and flue voicer Charles Harris formed the firm of Woodberry and Harris. The firm espoused a relatively conservative approach to organ building in the late 19th century. Characteristics of Woodberry and Harris organs possess beautiful individual sounds that combine to create a well-integrated ensemble. Opus 111 was originally built in 1893 for St. John’s Roman Catholic Church in Providence, Rhode Island. The instrument fell out of use sometime during the 1950s. That it languished in obscurity was most fortunate for First Presbyterian Church, as it may have saved the organ from destruction or ill-conceived alterations to its original state. A devastating fire in 1983 destroyed the Sanctuary of Waynesboro’s First Presbyterian Church. Then-Director of Music, Dr. R. Edward Zimmerman, and co-organ committee chairs Helen Allen and J.L. Barksdale, were responsible for securing an organ to reside in the new chancel. They met with the Executive Director of the Organ Historical Society, William T. Van Pelt, and the Director of the Organ Clearing House, Alan Laufman, to explore the acquisition of an historic organ no longer in use in its original location. It was through the vision of these and other individuals that the church became aware of the availability of this magnificent instrument. First Presbyterian Church contracted with the Andover Organ Company of Methuen, Massachusetts to re-locate the instrument to Waynesboro. The Andover firm conscientiously removed the organ from St. John’s, restored and, in order to accomodate the demensions in the new sanctuary, somewhat reconfigured the instrument at their shop. 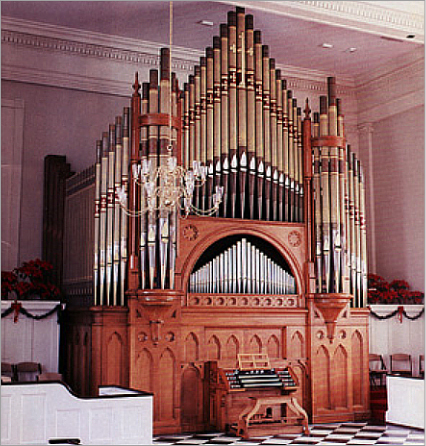 The organ (concurrently Andover’s Opus R-265) was installed in First Presbyterian Church’s newly constructed Sanctuary in 1986. With proper care and maintenance, Opus 111 can easily provide inspirational support to the worship experience for another 125 years.